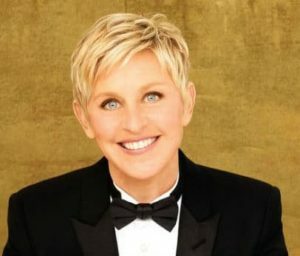 Ellen Lee DeGeneres is a television host, actress and producer born in Metairie, Louisiana, U.S. DeGeneres’ stand up career began in the early 1980s. She was invited to appear on The Tonight Show Starring Johnny Carson. Appearing on The Tonight show was a significant endorsement that propelled her career as a comedienne. She has also starred in several films such as Mr. Wrong (1996), appeared in EDtv (1999), and The Love Letter (1999) and provided the voice for the character Dory in Disney’s Finding Nemo which was released in 2003. Furthermore, she starred in 2 television sitcoms, Ellen and The Ellen Show which aired for approximately a year in 2001. During the fourth season of her show Ellen, she announced publicly that she is a lesbian. She subsequently married her girlfriend Portia de Rossi in 2008. She is currently a vegan and runs a website titled Going Vegan with Ellen in which she promoted vegan recipes. She is also an animal rights activist. 5 feet 7 inches – How tall is Ellen DeGeneres with shoes? When she is wearing shoes, she is 5 feet 9 inches tall. 130 lbs – How much does Ellen DeGeneres weight in 2014? According to Huffingtonpost.com, she stays energized by eating vegan and avoiding all sugar and processed foods.